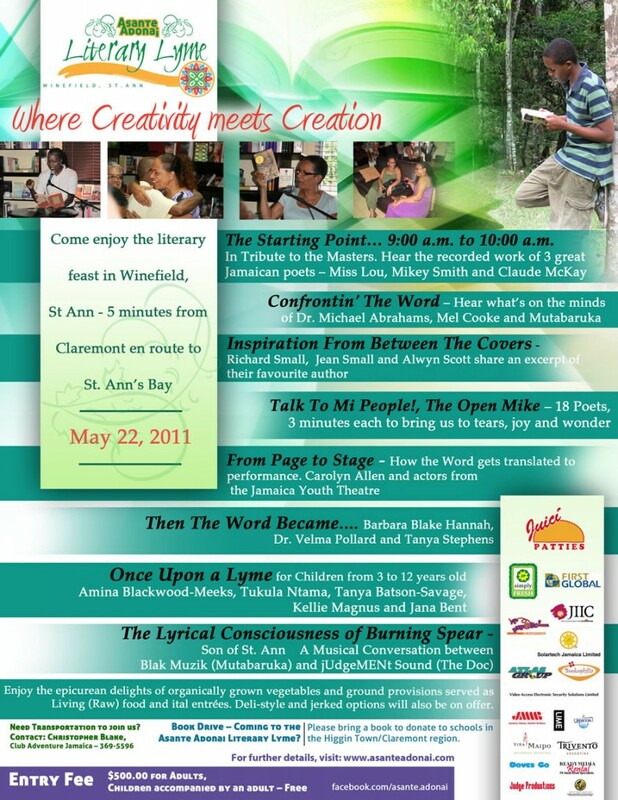 The first Asante Adonai Literary Lyme will be held this Sunday, May 22 in Winefield, St. Ann to help raise awareness of the importance of a literary culture and the importance of being well-read. Created in the wake of Calabash’s demise, the Lyme’s organizer Leachim Semaj hopes it will engender goodwill and a make a positive contribution to nation building. Guests are being encouraged to participate in the Book Drive, by bringing a book to donate to the St. Ann’s Bay Library, and to “Keep it Green” by carpooling. Bookophilia, the official Bookstore of the Asante Adonai Literary Lyme, will have books on sale by Authors taking part in the Lyme. For more info, check out their website asanteadonai.com. What attracted me to this blog was the name of the event. I know Adonai means god/s, I wonder what the literal title of this event means.